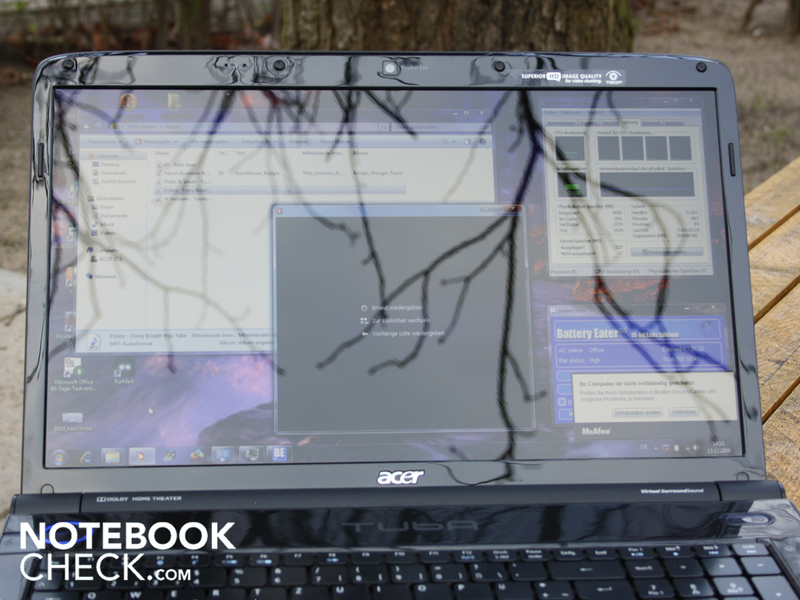 The Acer 7738G might have been put underneath the Christmas tree for 999 euro. The massive 17.3 incher wants to convince fans of fat performance with an Intel Core 2 Quad Q9000 processor. If this bundle with the mainstream graphic, GeForce GT240M, finds enough persuading arguments in the end is checked in the following review. Acer's 7738G range is aimed at laptop buyers who want to put an efficient 17.3 incher on the desk instead of a desktop PC. Four core processors have already found their way into the lowest price regions of the desktop world. These days, you can buy an AMD Athlon X4 620 CPU with 2.4 GHz for 70 euro. 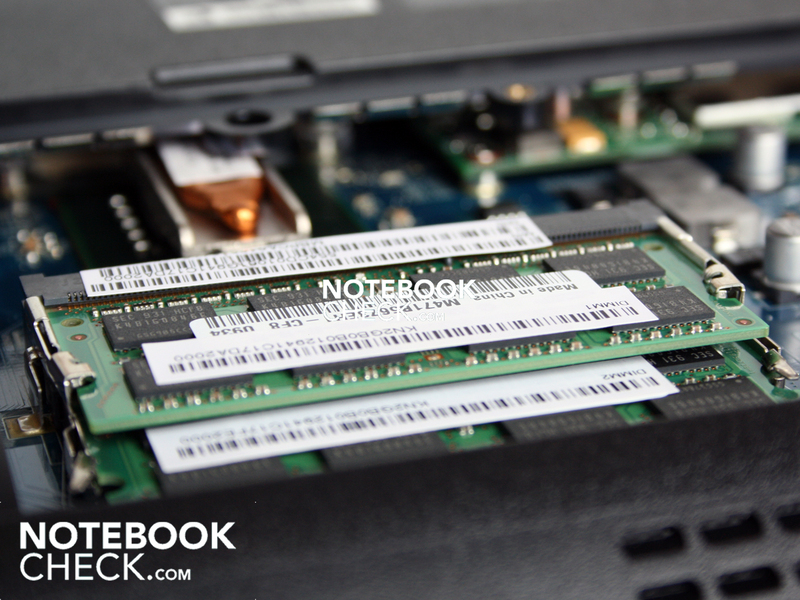 So why not treat yourself to the luxury of four CPU cores in a notebook? - Endless power at video cutting and gaming. Or maybe not? We'll check what the 7738G desktop replacement is capable of. Scrutinizing whether or not an "old" Core 2 Quad is still worth it is faced, especially in view of the current Intel Core i7 CPUs and the upcoming Core i5 with two cores. The 17.3 inch case justifies its size with 3.36 kilograms. You shouldn't forget the 120 watt adapter if you have to carry it. It adds a further 730 grams in the notebook case. Apart from that, the chassis isn't only a hunk - it's also very stable. We couldn't depress the wrist rest anywhere, not even with excessive force. The keyboard has a tight fit over almost the entire surface. Merely the numerical block's upper keys yield a bit. The bottom has two maintenance covers but can't be pressed anywhere. A bar with the inscription "Tuba" is above the keys. The loudspeakers have been placed underneath this. A semi-circular tube adjoins along the top. It's the bass tuba. The half-round form fits well into the design and the hinges are placed here at the same time. These have been manufactured very well and sit tight in their place. The half-round hinge joint is, different than in many other notebooks, not only decoration for a hidden metal hinge beneath it. The hinges have been pulled very tight so we always needed two hands for opening the lid. The display lid leaves a less perfect but still good impression. It can be twisted slightly and the surface can be depressed evidently. A lot of place between the connections. A closer look at the configuration reveals weaknesses in interface alignment. To name them: a Firewire port, an ExpressCard54 slot and an eSATA interface. Not every user will necessarily miss them, but they do simply belong to a good desktop replacement. 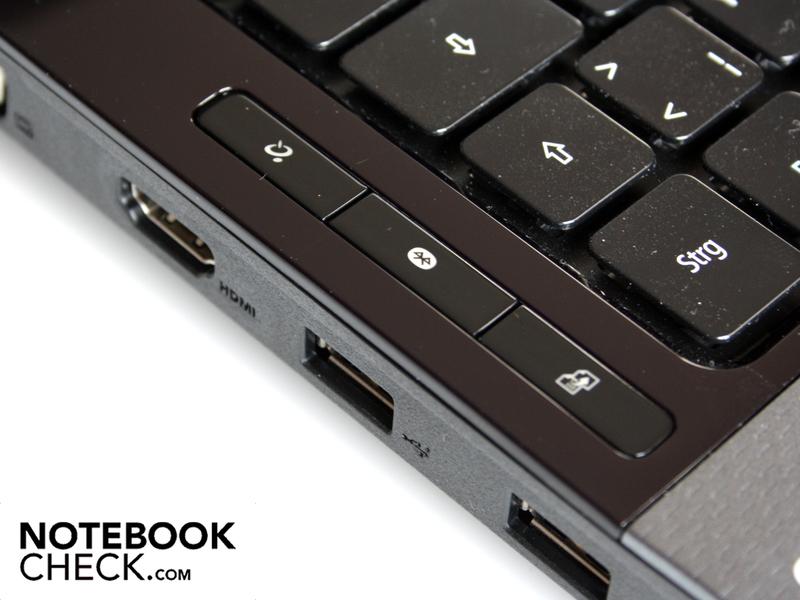 The 7738G has four USB ports with good distribution on the pro side. The left ports are, however, too close to each other. 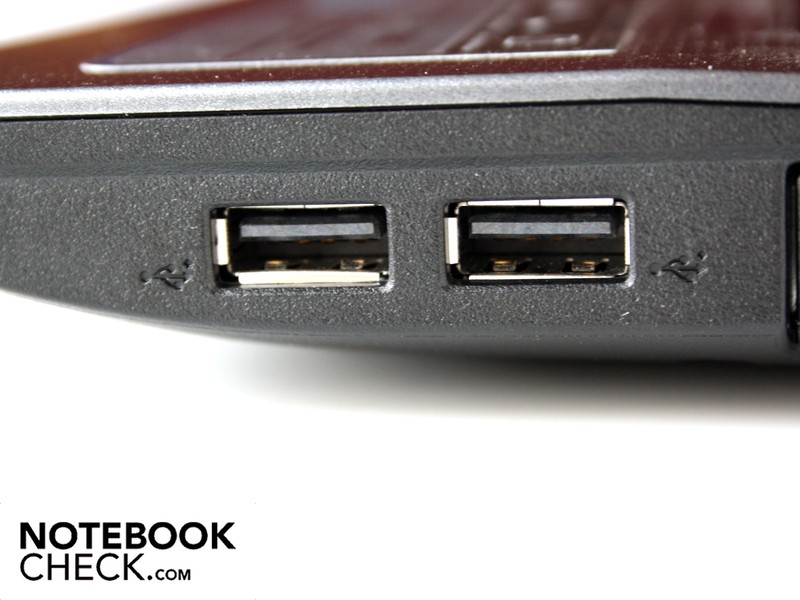 A HDMI port hasn't been left out, just like an Ethernet and modem port. Many manufactures omit the latter because it's not as necessary anymore. 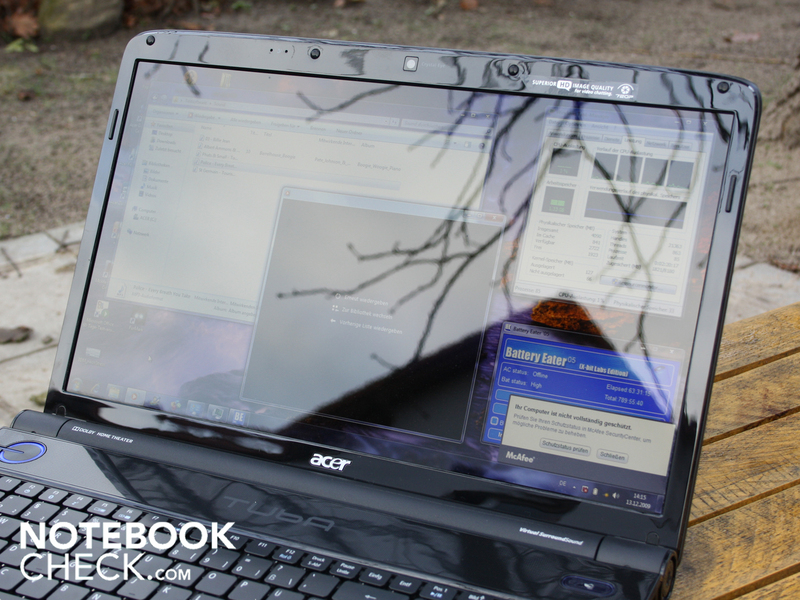 Acer doesn't include a remote control with the Aspire 7738, although it's perfect for consuming DVDs or TV contents. An infrared module on the front can't be found anyway. 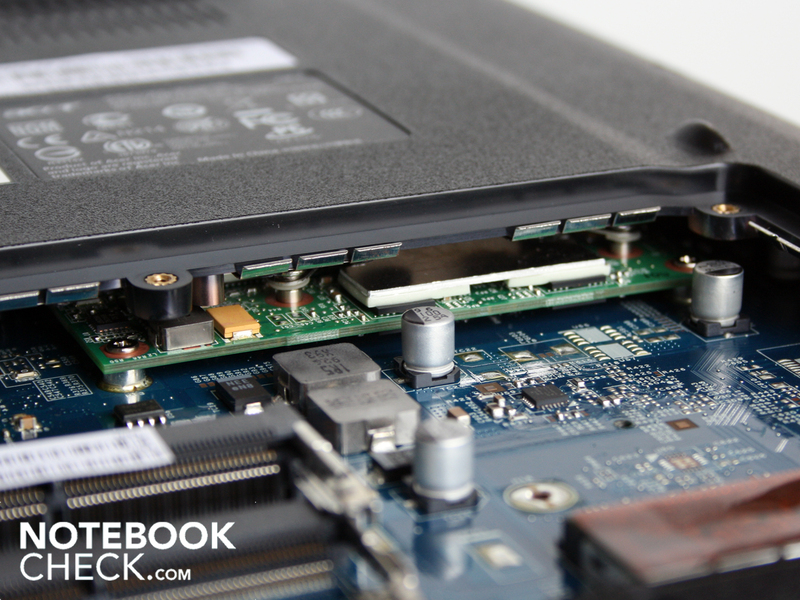 You also don't find an integrated DVB-T module inside the laptop. This seems to be intended because there isn't a slot for a small antenna socket. The notebook's rear is prevailed by the bass tuba. Thus, there's no place for cables and interfaces. However, Acer uses the maximum of wireless modules. 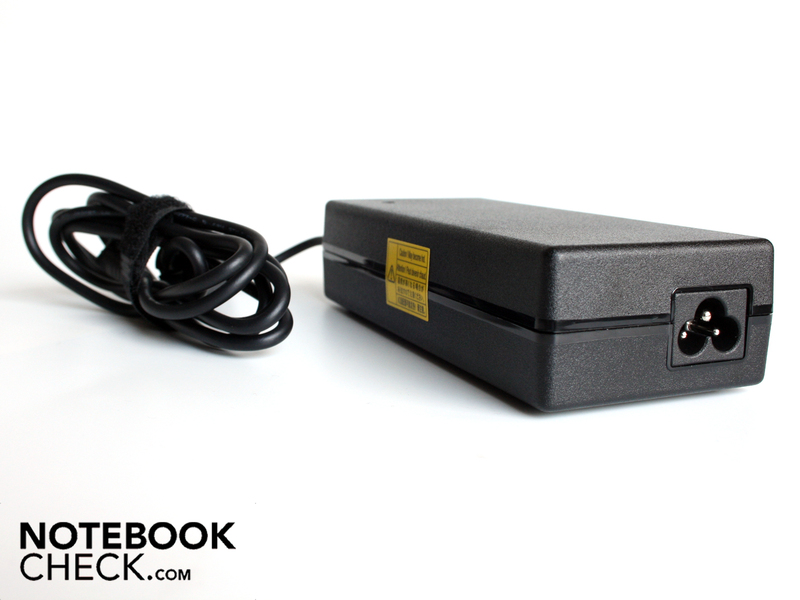 A quick draft-n WLAN module sends data lightening fast to the FritzBox. A Bluetooth module takes up contact with the cell phone or wireless mouse. 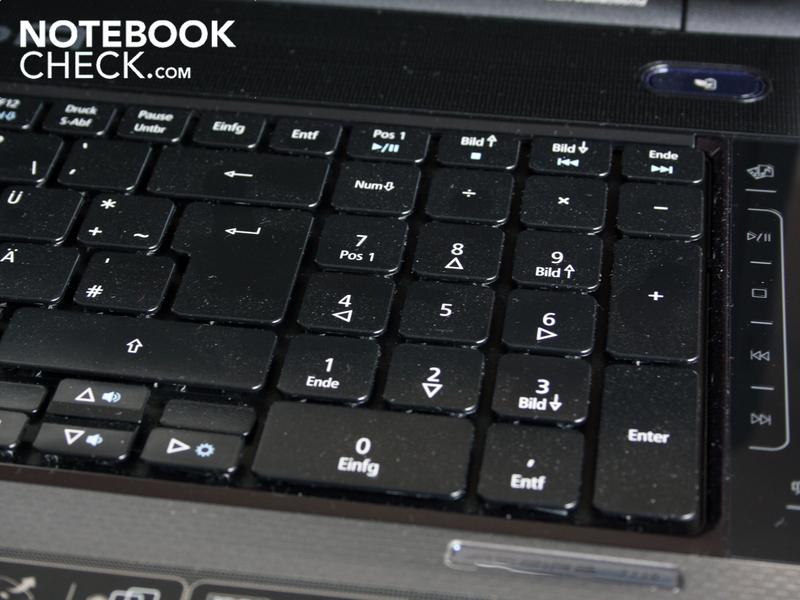 The keys use the entire available surface resolutely. The input is delimited by the MediaControl field or three hot keys on the right and left. The keys have a solid stroke and a distinct stroke length. 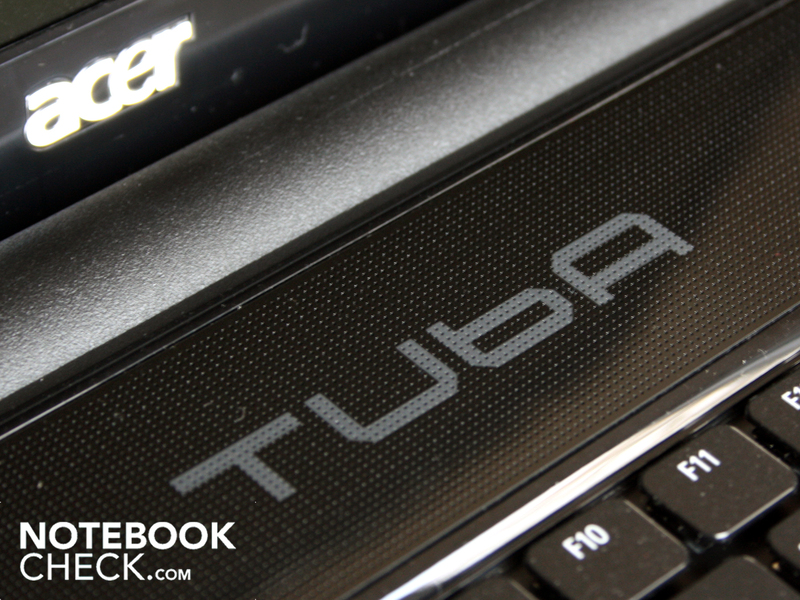 Unfortunately, Acer ruins the good keyboard approach with the smooth key surface all by itself. A less gripping and indistinct typing feel is created in connection with the level texture of every single key. Frequent typists should trial type on the keyboard in any case. 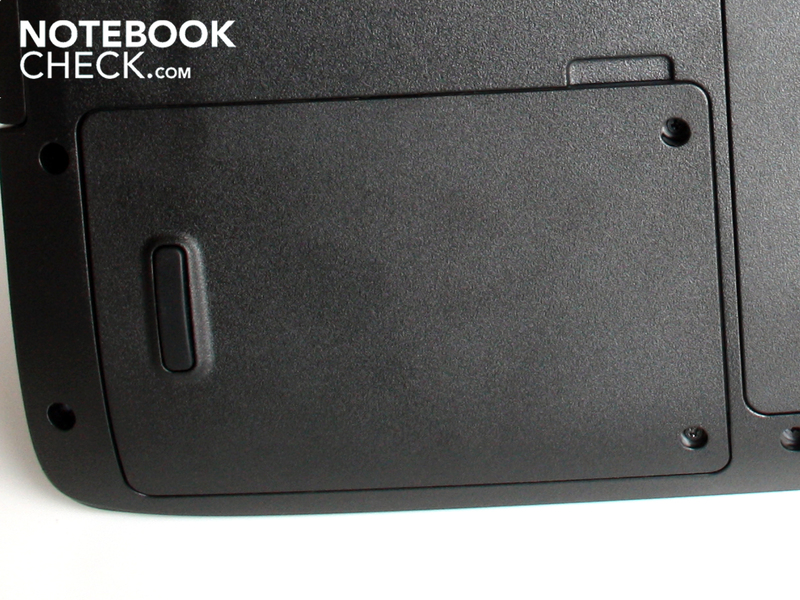 The manufacturer has embedded the touchpad into the wrist rest. It can even be apprehended without looking because of its gentle immersion but it has the same haptical texture as the rest of the wrist rest. We quite liked the separate scroll bar. 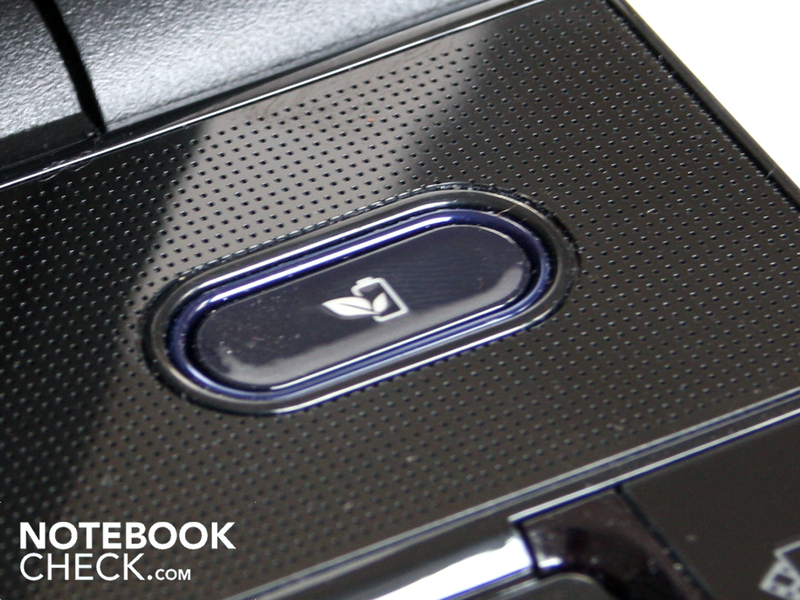 Users who don't want anything to do with the pad's multi-touch characteristics will welcome this retro step. The pad's matt surface can be used pleasantly, it stays cool and doesn't collect fingerprints. Unfortunately, the MediaControl bar on the right is a bit stiff at use. This doesn't apply to single keys, like those for calling up Acer's media player, but especially to the volume control. We rarely achieved adjusting the level evenly or selectively with strong or gentle pressure. The sound was suddenly completely muted in a game after trying to increase the volume and couldn't be reactivated at all anymore. A friend in need are the alternative FN keys that change the volume with the arrow keys, right and left, reliably. 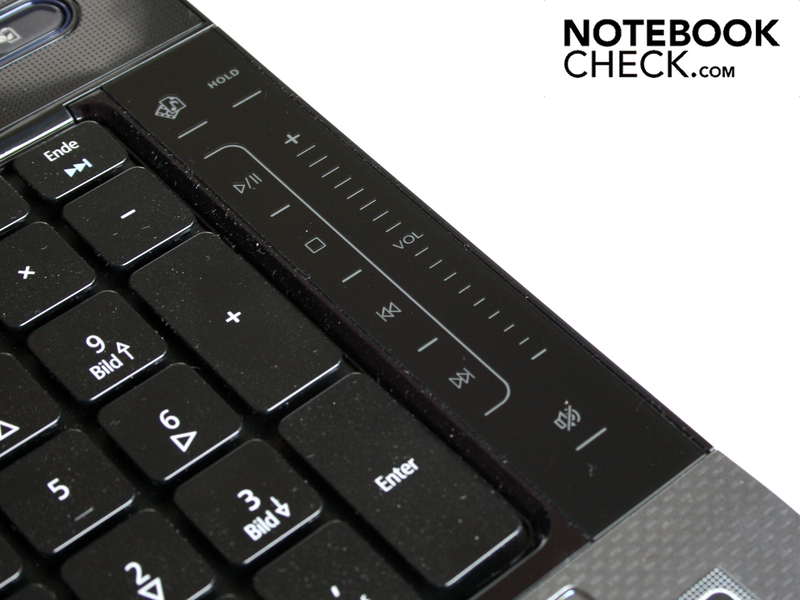 The keyboard uses the notebook's entire width. The keys have a solid stroke and sit tight. The touchpad has a pleasantly matt surface. 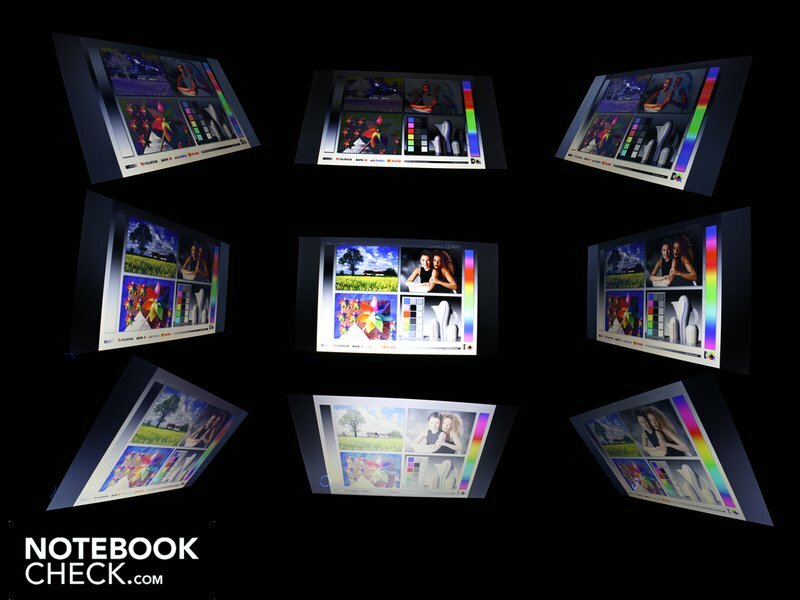 The 17.3 inch display has a resolution of 1600 x 900 pixels and thus calls itself HD+ display. The screen's contrast is, however, below our expectations. We assessed 200:1 with a black value of 0.96 cd/m2. This rate is too low for a desktop replacement. Good contrasts indicate brilliant colors and a deep black. The brightness evaluation shows itself in a good light. The Aspire 7738G also doesn't need an especially high luminosity as a desktop replacement, for instance for planned outdoor use and the 192.7 cd/m2 suffices completely. Aspire 7738G owners should better leave their 17 incher at home. The reflective display provides for intense reflections in sunlight. This doesn't mean that a use in daylight is completely impossible. But, the user should look for shadowy places and a suitable position to the light source. The 17.3 inch screen's viewing angles are stable up to ca. 45 degrees deviation on the horizontal viewing plane. First then, do your eyes experience evident dimming and a color inversion. This negative effect already turns up at a deviation of about 20 degrees on the vertical plane. Dark letters on a bright background tend to be less viewing angle dependent than colors and images. 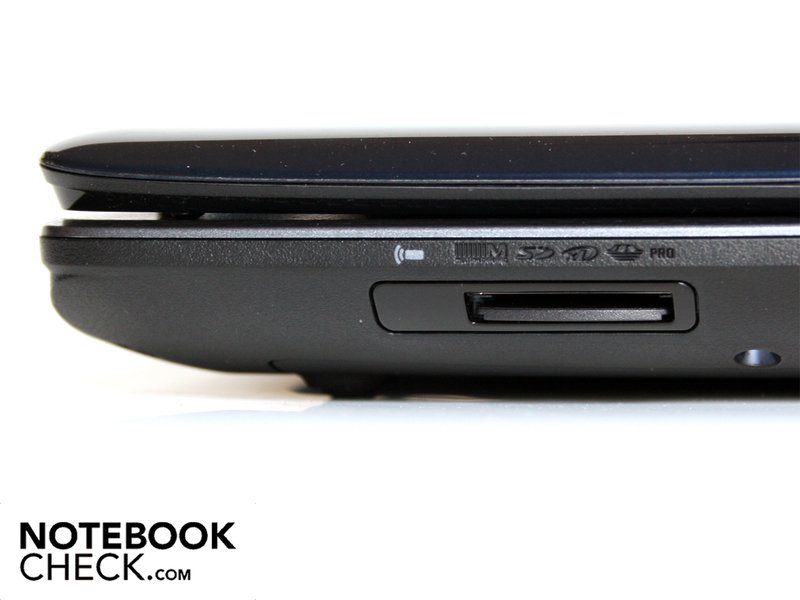 The low viewing angles of the desktop replacement, Aspire 7738G, mean that DVD sessions with friends will be difficult. The one or other will likely be unsatisfied with his viewing position. 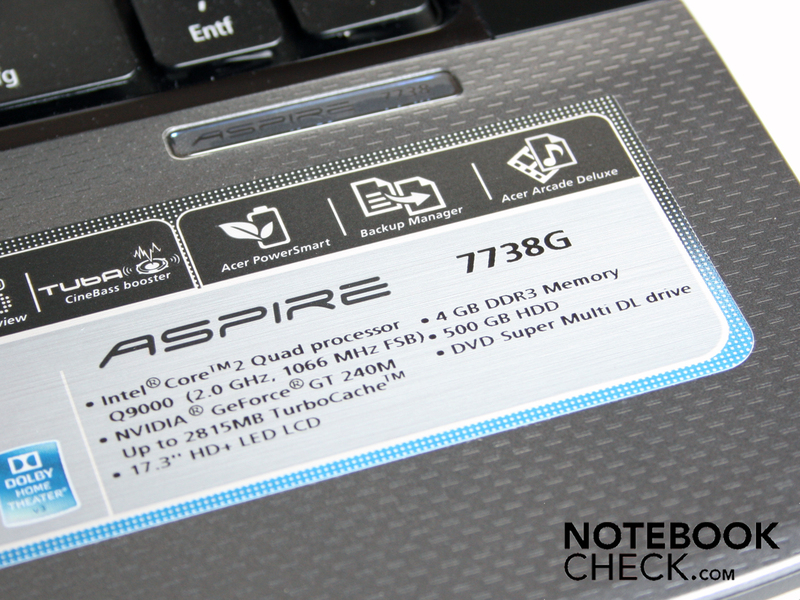 The Aspire 7738G is equipped with a four core processor from Intel. 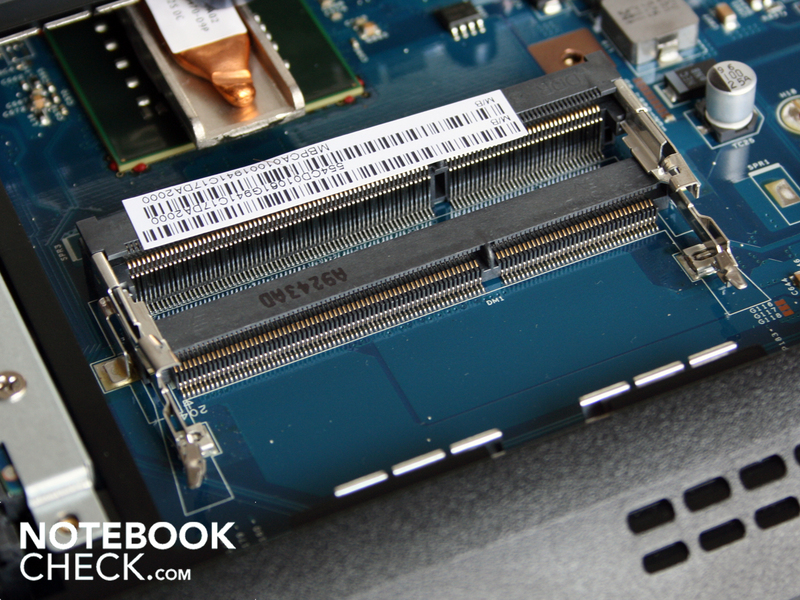 The Core 2 Quad Q9000 only has a clock rate of 2.0 GHz. The L2 cache of 6 MB is almost gigantic. The same, but with the opposite meaning, applies to the high TDP of 45 watts. Because it's not a Core i7 quad-core, multi-core applications will benefit, but single-core applications will be at a disadvantage, from the average clock rate. That will become obvious in the gaming tests and application benchmarks. The Q9000 is supported by a four gigabyte fast DDR3 RAM. This is located on two module of 2048 MB each. 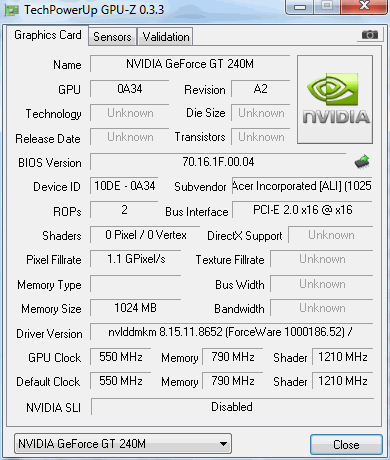 Nvidia's GeForce GT 240M with a 1024 MB DDR video memory takes over the graphic computing. This middle class GPU is typical equipment of multimedia laptops. The GPU based on the GT216 core is only suitable for gaming to an extent. If the Q9000 changes something about that will be seen in the next chapter about gaming performance tests. 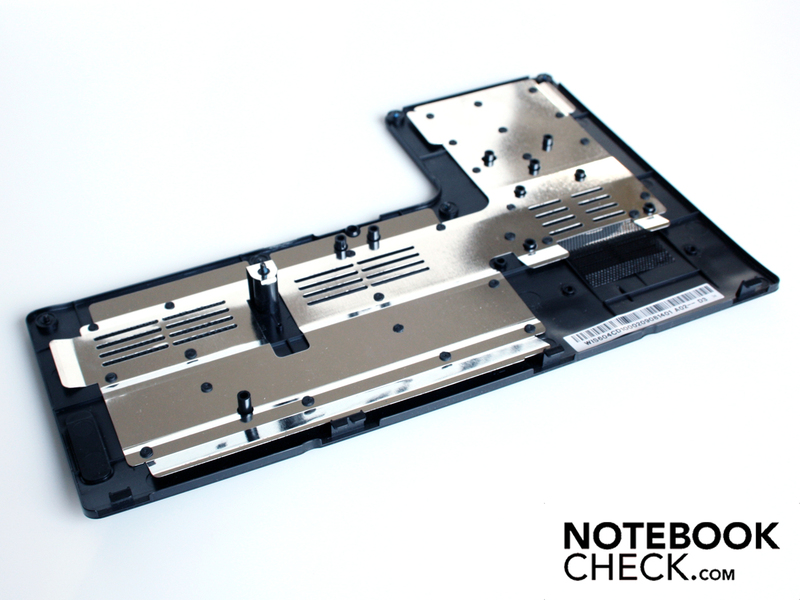 The Q9000 is on the same level as the Core 2 Duo T6500 (2.1 GHz), which is built into many low priced all-round notebooks, in Cinebench R10's single-core benchmark. First using all four cores in the multi-rendering benchmarks lets the Q9000 get almost as fast as a Core 2 Xtreme X9100 (3.06 GHz). The Core 2 Quad Q9000 and its sister model, the Q9100 (2.26 GHz, 12 MB cache) were the first mobile four core processors. As our comparison test of Intel's Core 2 Quads already proved: Users are first perfectly equipped for the future of games and applications when a high clock rate is combined with four cores. If you already know that your applications or games support four cores, you can buy a Q9000 without hesitation. But, you are presently using or will be using single and multi-core applications, you should prefer a laptop with a mobile Core i7 (four cores) or the upcoming Core i5 (two cores). These processors can overclock single or multiple cores dynamically, depending on the requirement. Thus, single-core applications get an extremely high rate (e.g. 2.9 GHz) or multi-core applications use four cores (e.g. 4 x 2.4 GHz). Currently, Core i7 laptops already start at a price of around 950 euro. We've already had a few models in review: MSI's GT640; mySN's XMG7.c; Asus' G60J; Deviltech's Devil 9700 DTX (W860CU); Acer's Aspire 8940G; Dell's Studio 1557; MSI GT740. The Core i5 available as of beginning 1010 will start at 600 euro. It would, however, be short sighted to only look at the processor speed in a DTR notebook. We establish the contribution of the hard disk, the RAM and the graphic card to the experienced work rate on the laptop with PCMark Vantage. The Aspire 7738G achieved an overall rating of 4878 points in PCMark Vantage. 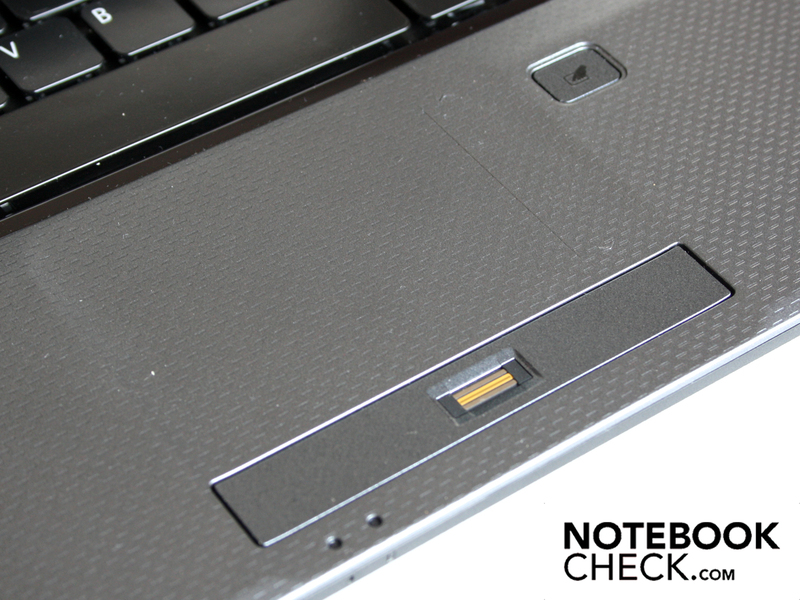 That's only a handful of points less than the HP Envy 15 with a Core i7 720QM achieves. But it's also around 600 points less than Dell's 15 inch Studio 1557 with a 720QM reaches. 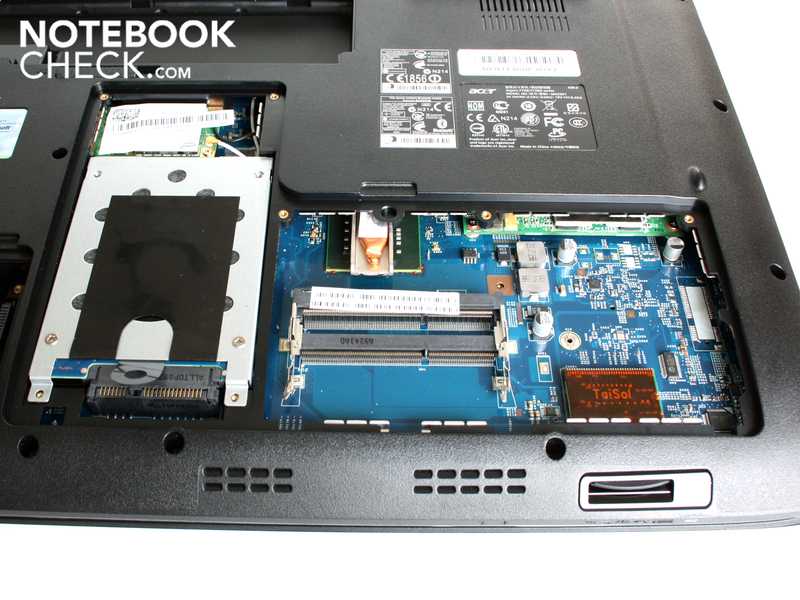 An Asus G60J could even achieve 6199 points due to fast components paired with a 720QM. In short: Users are on average faster en route than with the fastest Core 2 Duo CPU, such as the P9500 (2.53 GHz) or T9600 (2.80 GHz). The Q9000 has to admit defeat to the next quad generation i7. 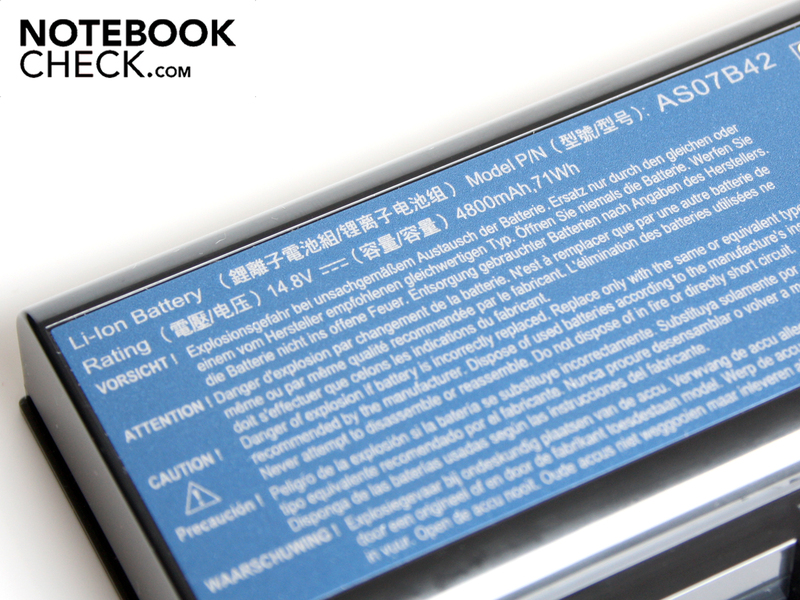 Power Smart was the name for the battery mode created for Acer's energy savings mode. The same is enabled via a hardware button over the numerical block. Window's preset energy mode (balanced, high performance, etc.) doesn't play a role. The processor is computing with its full 2.0 GHz when the key lights up green. The CPU is only computing with 1.6 GHz when the key isn't lighted. Thus, 1.6 GHz is the energy saving standard for battery mode. The clock rate limitation is cancelled when Power Smart is enabled (key lights up). The key hasn't any effect when the laptop is plugged to the mains. Initially, Acer built in the Power Smart key to switch between hybrid graphics. But only Nvidia's Geforce GT240 does the job in Acer's 7738G. Cinebench R10: The quad-core processor Q9000 almost quadruples the multiple CPU performance. The Q9000 has a clock rate of only 2.0 GHz. We took a look at the latencies under Windows with the DPC Latency Checker tool. If these are too high, it can come to problems at connecting external devices (for example sound crackling with external sound cards or short interruptions in Real-Time-Audio). The rates were partly over 2000 µs. As a rule, erroneous drivers of internal devices, such as WLAN adapter, soundcard, USB Host Controller or the like, are the reasons for this. The trouble maker can be found out by selectively disabling single drivers. Then the problem might be solved by updating the driver. The Hitachi hard disk (type HTS545050B9A300) with a gross capacity of 500 GByte reads data from the disk with circa 62 MB per second. 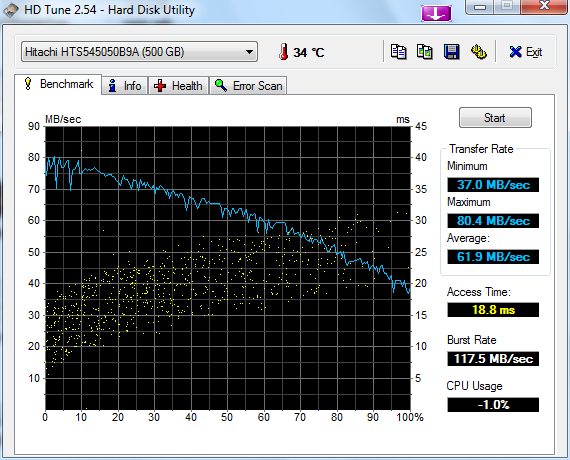 This throughput is within a good average of all notebook hard disks from our reviews. The Q9000's low clock rate of 2.0 GHz has a negative effect on the gaming performance in most cases. The reason: Games with multi-core support are rather an exception. In addition there is the middle class GPU, Nvidia's Geforce GT 240M, which is comparable with a fast Mobility Radeon HD 4650 (DDR3 VRAM). 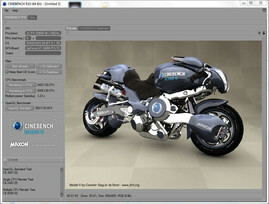 The 3DMark 2006 finishes with 6308 points, whereby it can benefit from the four cores. 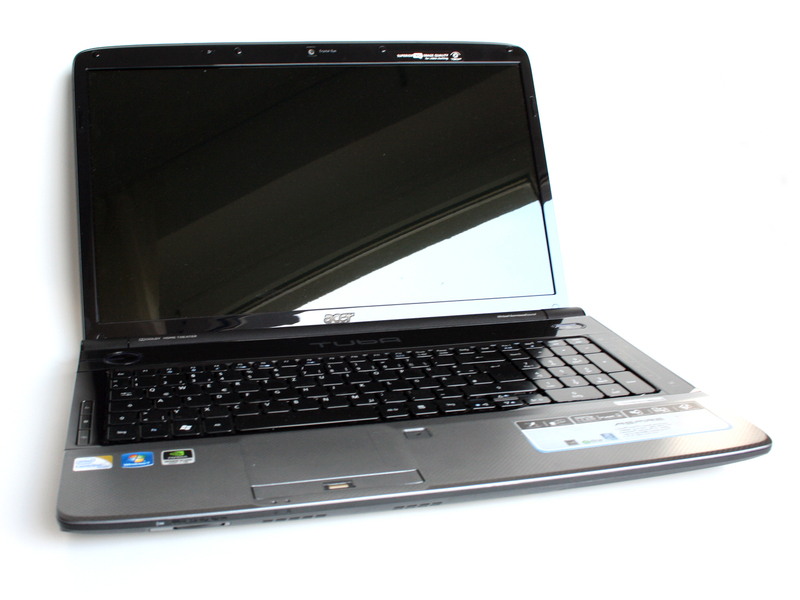 Other GT240M systems, with the same clock rate as Acer's Aspire 5739G (P7350 2.0 GHz), reach 5857 points in 3DMark2006. The GT240M in the 7738G is equipped with a 1024 MB DDR2 SD RAM and clocks with 550 MHZ in the core and 790 MHz in the memory. Crysis is smoothly playable in medium details and a low resolution (1024 x 768) with 37 fps. The shooter doesn't benefit from the four cores, as even a T6400 (2.2 GHz) as in Samsung's R522 (Mobility Radeon HD 4650), reaches almost the same frame rate (36 fps). The same for the fantasy adventure Risen. 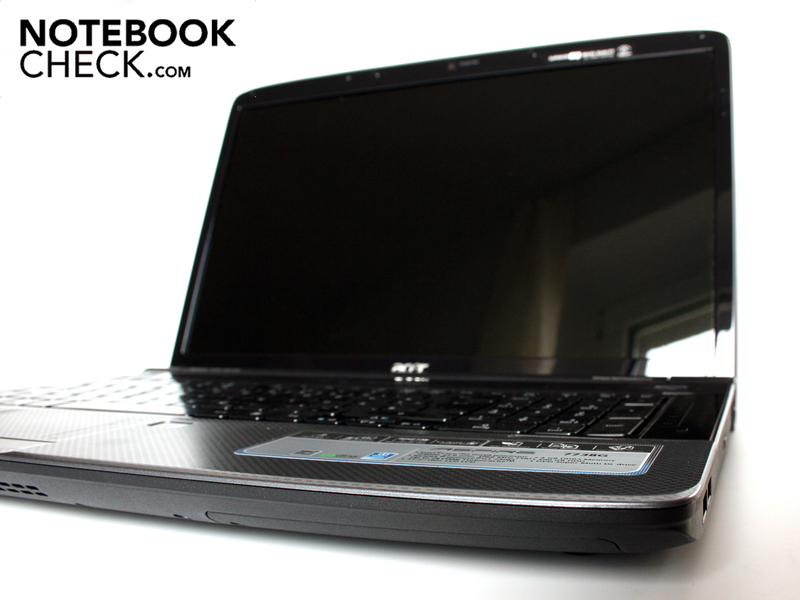 The Q9000 has to admit defeat to laptops such as Fujitsu's Amilo Pi 3560 (T6600 2.2 GHz, GeForce GT 240M). Merely 21 fps are possible in medium settings. Finally a game that is said to have an affinity for multi CPUs. And it works - the Q9000 test system protrudes in regions for which a strong GPU, àla GeForce 8800M GTS or GeForce 9700M GTS would be needed up till now. 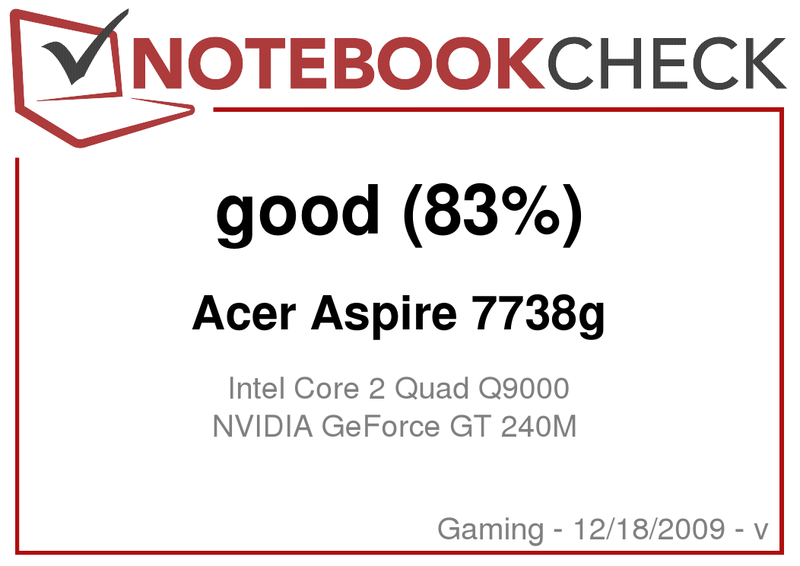 But the Aspire 7738G still lacks a whole 10 fps to strong gaming laptops with a GeForce GTX 260M. WiC is playable with 28 fps at a resolution of 1024 x 768 pixels in a high detail level. In return, this shooter can't benefit at all from four cores. 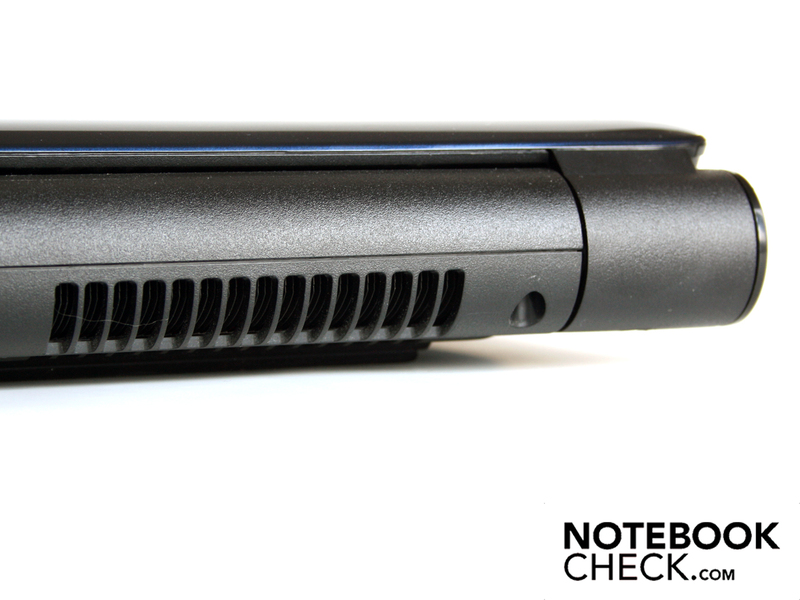 The 7738G is even a bit under that of an Aspire 5739G with P7350 (2.0 GHz) and a GeForce GT 240M. 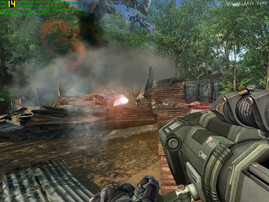 The game is playable with 57 fps at a resolution of 1024 x 768 pixels (high). Playing in the native resolution (1600 x 900) isn't possible in high details. 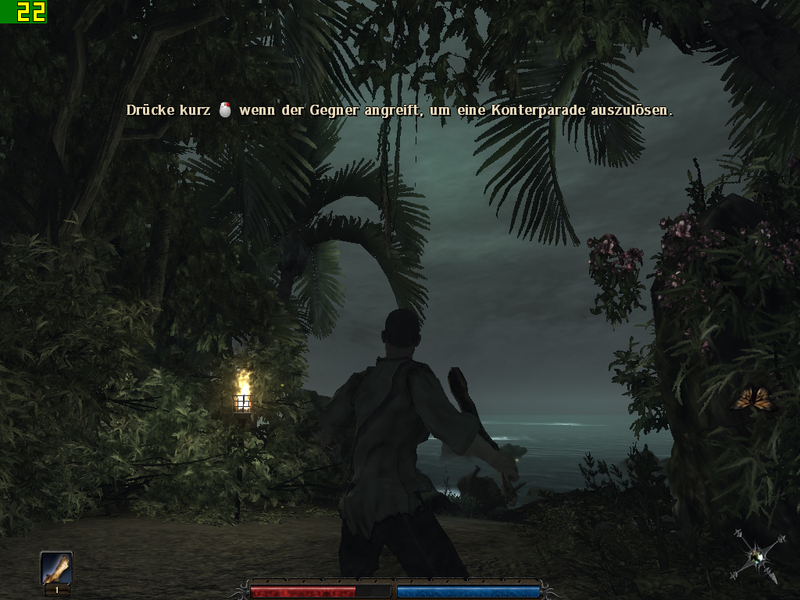 The action game runs smoothly at 1024 x 768 pixels in high details with 35 fps. 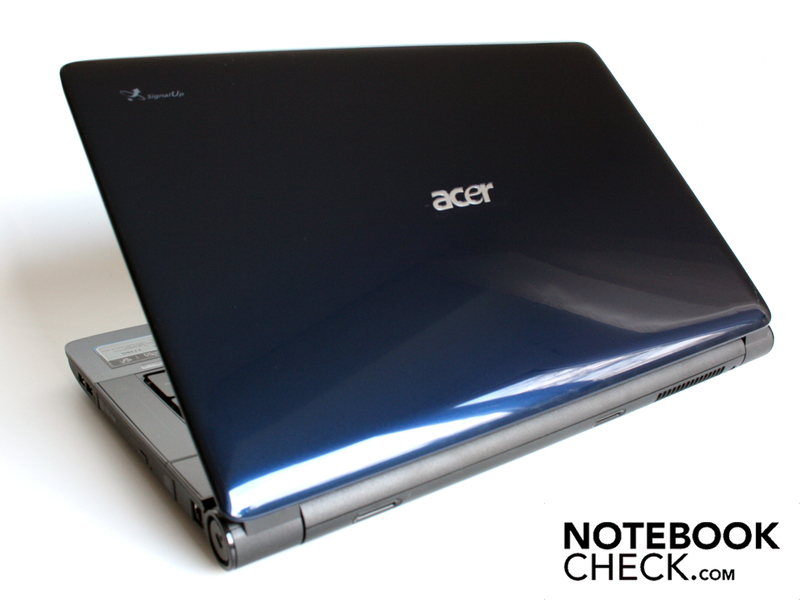 It's a bit weaker than Acer's Aspire 8935G with the same CPU but a Mobility Radeon HD 4670 graphic, though. This system achieved 42 fps. But the lower processor rate of 2.0 GHz isn't the restricting factor in FarCry 2. Systems, like Dell's Studio XPS 16 with Intel's P9700 (2.53 GHz), reach a similar 36 fps with an identical weak middle class GPU, Mobility Radeon HD 4670. Air emissions towards the floor. Careful with carpets. The Aspire 7738G is absolutely silent - but this only applies to a period of a few minutes in idle state when there is no input. Otherwise, the fan stirs constantly and isn't even impressed by the energy savings mode. We established an average of 36.6 d(B)A when the laptop doesn't have much to do. For such a big case, in which there should actually be a lot of place for a clever cooling system, it's a lot. The cooling really starts up as soon as the 17.3 incher is really challenged, so for instance in demanding computer games. The system noise increases to 41.3 and partly to 44.1 dB(A). This isn't only very audible but also annoying in the long run. In this case, headphones or the good, built-in loudspeakers help at gaming. The fan emits a constant white noise, which rarely turns up impulsively. We also heard a high whistle under high load at 44.1 dB(A), which is created by the air flow in the notebook at a certain velocity. At least the not always quiet fan provides for a reasonably cool case. We measured 42.6 degrees Celsius on the upper side's warmest point after a stress test with Furmark (graphic card) and Prime95 (processor). This is a very high temperature but the important areas, like wrist rest, touchpad or numerical block, stay a lot more agreeable with 25 to 29 degrees. But gamers will have to be prepared for warm fingers on the WASD keys. The upper side doesn't exceed 31 degrees by much in office mode. The wrist rest is then even only slightly above room temperature: 25 to 27 degrees Celsius. The 17.3 incher's base plate calls for special attention at use. 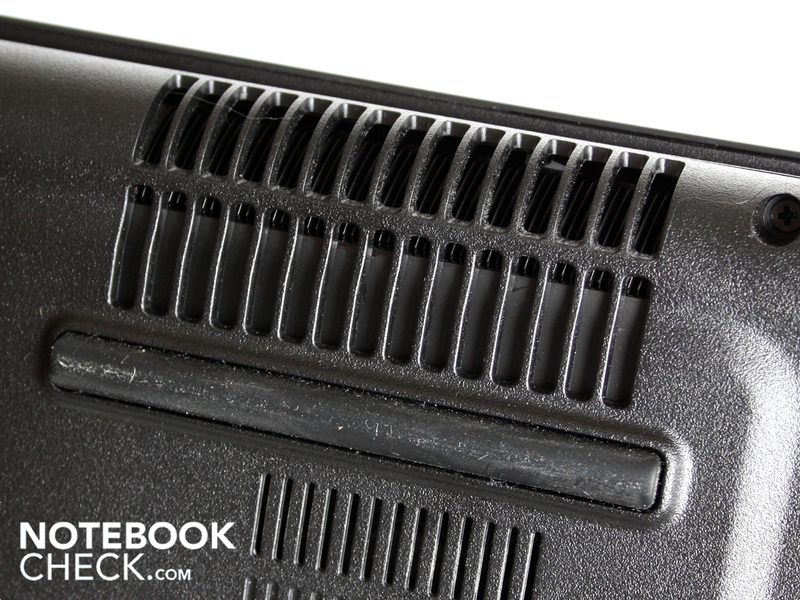 An artificially elongated laptop foot makes sure that the warm waste air isn't retracted as cooling air right away. The user has to forego on fluffy surfaces, such as carpets or blankets, though. Thus, a game of Risen underneath the sofa blanket is taboo. For this reason and also because of the weight and high waste heat, a use on the lap isn't recommendable. If you do that, you'll have to cope with 36 to 38 degrees Celsius under load. The cooling system can be called efficient despite the drawbacks in terms of system noise. The sensors on the four core CPU merely measured 77 degrees after our 12 hour stress test for processor and graphic card. The Nvidia GPU reaches 71 degrees at the same time. These temperatures are within an uncritical normal field. The cooling system would even be capable of dispensing an even higher waste heat. A 3DMark2006, executed directly after the 12 hour stress test, ended with the same result as in a cold operating state: 6314 3Dmarks. It was 6308 points without the stress test. So, there wasn't any recorded throttling due to overheated components. (±) The average temperature for the upper side under maximal load is 32.9 °C / 91 F, compared to the average of 32.9 °C / 91 F for the devices in the class Gaming. Rare: There is a genuine line-in. The bass roll has small openings on the rear. Theoretically, the advantage of a 17 incher is that the manufacturer can build in good sound systems with a subwoofer and two loudspeakers. 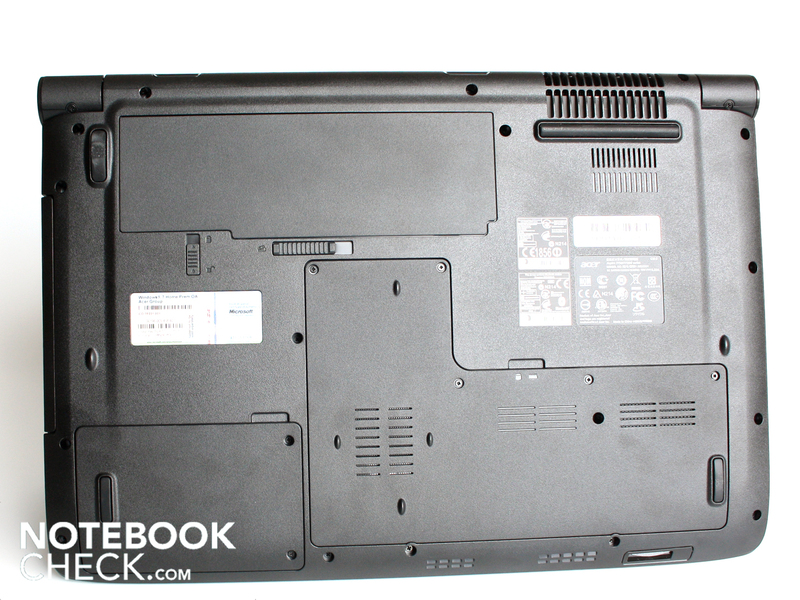 The Aspire 7738G belongs to the category of acoustic strong laptops. Acer doesn't build the subwoofer, responsible for deep pitches and basses, into the base plate but into the tuba bass roll instead. 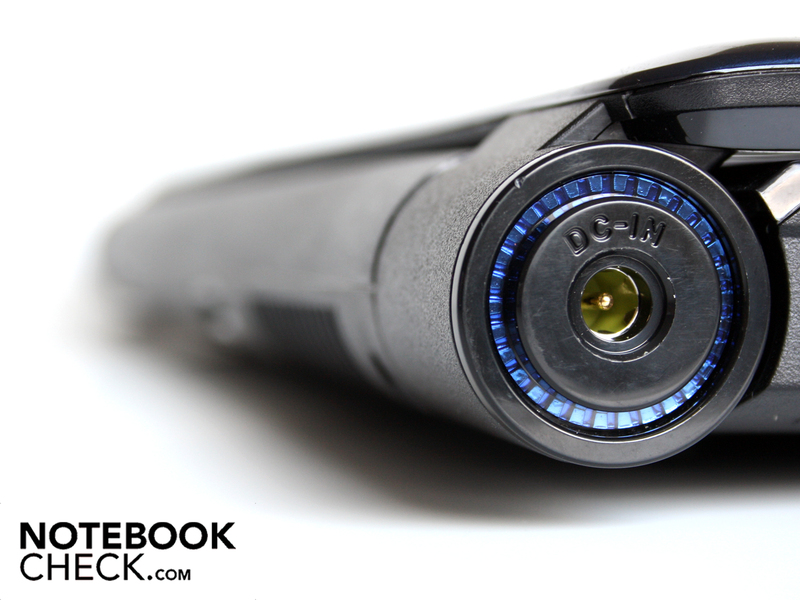 This hollow tube is placed in the rear part of the laptop and has two openings for letting sound waves escape. The sound created this way is impressive. The basses are also palpable on the wrist rest as a vibration with techno beats or rock music. High and low frequencies are balanced and the basses come across powerful. We recommend users to absolutely keep the Dolby Audio Enhancer settings of the rendering devices enabled. The sound got a lot flatter and undifferentiated as soon as we disabled this option. In return, the Dolby Surround option is a matter of taste. If you attach an external sound system, you'll be delighted about three audio sockets. A real line-in belongs to the array aside from the headphone-out and the microphone-in. We connected an external loudspeaker via the headphone-out. 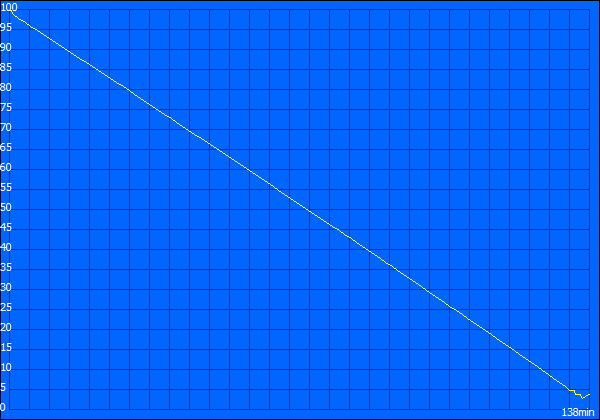 The resulting output level is very high. The targeted stereo loudspeakers can reach extremely loud levels with ease. Agreeably, a white noise doesn't turn up at the lowest output level. The 17.4 incher's battery life isn't very long, as expected. Only 123 minutes pass in a typical use with enabled WLAN, full brightness and visiting news portals until the 4400 mAh battery hisses the white flag. Thus, two hours is the reference value for a fairly undemanding use. Acer's Power Smart mode was disabled for this test. This operating mode cancels the processor's clock rate of 1.6 GHz and sets the normal 2.0 GHz rate. 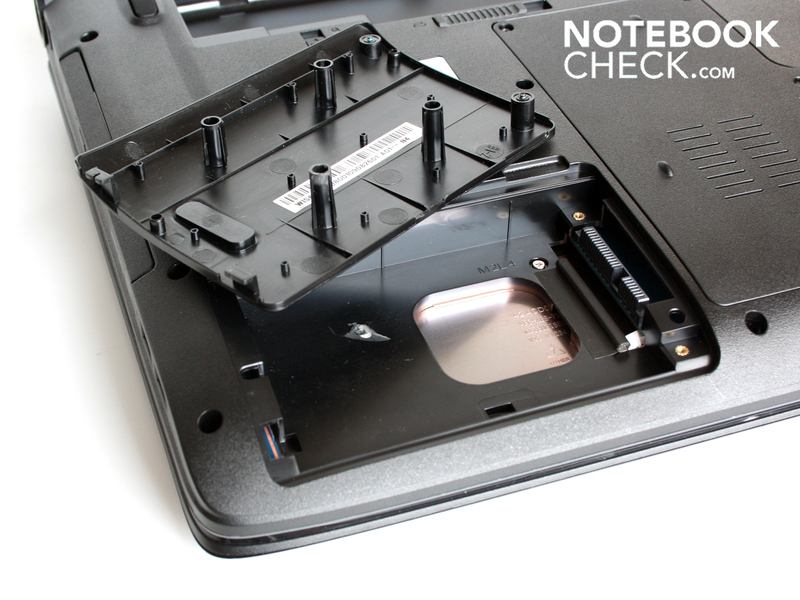 A runtime test during DVD watching belongs to routine in our examination of the battery life. The movie ended after a good two hours (138 minutes). The idle runtime with all energy savings options enabled was astonishingly high. We assessed 4:49 hours with the BatteryEater Reader's test (289 minutes). This runtime is unrealistic in true life use because a DTR will barely ever be used for inputting text on a dimmed screen. As expected, the 17.3 incher's power consumption is in view of the four core processor, Intel's Core 2 Quad Q9000, high. We measured a power consumption of 96.3 watts (without battery charging) from the mains under processor and graphic load. Thus, the 120 watt adapter is urgently needed. 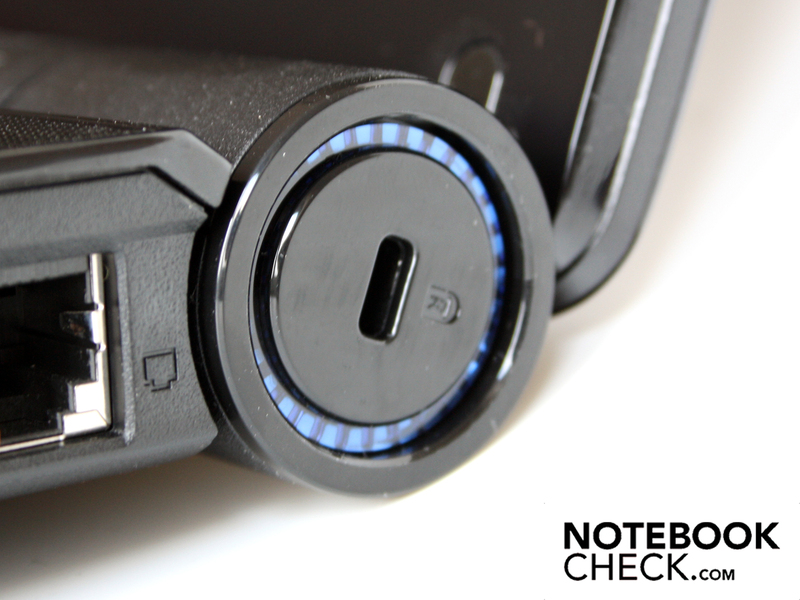 The power consumption sinks drastically to about 28 watts when the Aspire 7738G doesn't have much to do in office mode. All wireless connections were enabled and the brightness on maximum for this evaluation. Life punishes latecomers. The Acer Aspire 7738G with Intel's quad-core processor, Q9000, might have been a real multimedia hit half a year ago at this price. Now, the Core i7 processors from Intel have already found their way into many available laptops. The four core successor, Core i7, will replace the Q9X00 range in the short term because it doesn't have the biggest weakness, the low single core clock rate, anymore. The Q9000 in Aspire's 7738G puts single-core applications at a disadvantage. Core i7 supports these with Turbo Boost as required. 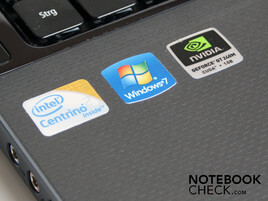 Core i7 notebooks are already available for about 950 euro and the prices are sinking. Potential buyers should therefore consider exactly if the purchase of a quad core processor of the first generation is still worth it. 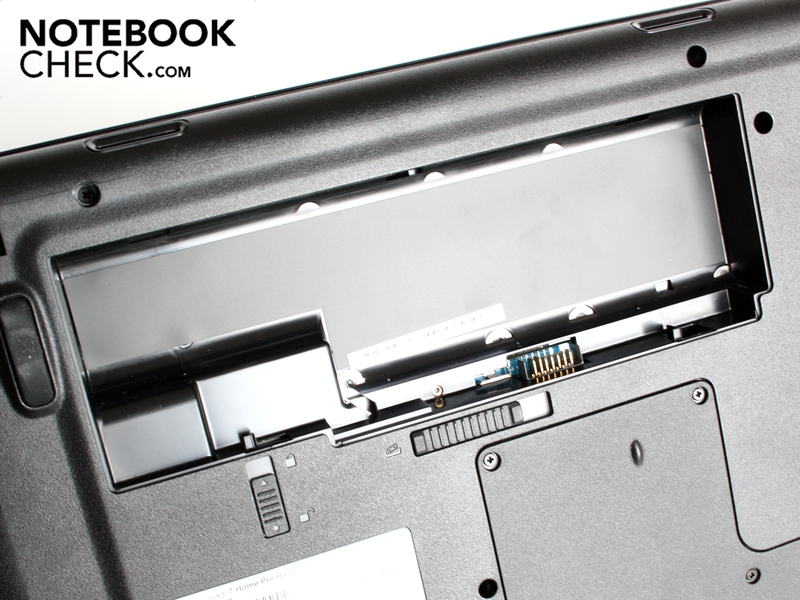 A good workmanship and a, for a 17 inch laptop, reasonable battery life of a good two hours speak for the Aspire 7738G. The sound quality with rich basses and balanced high, medium and deep frequencies is very felicitous. 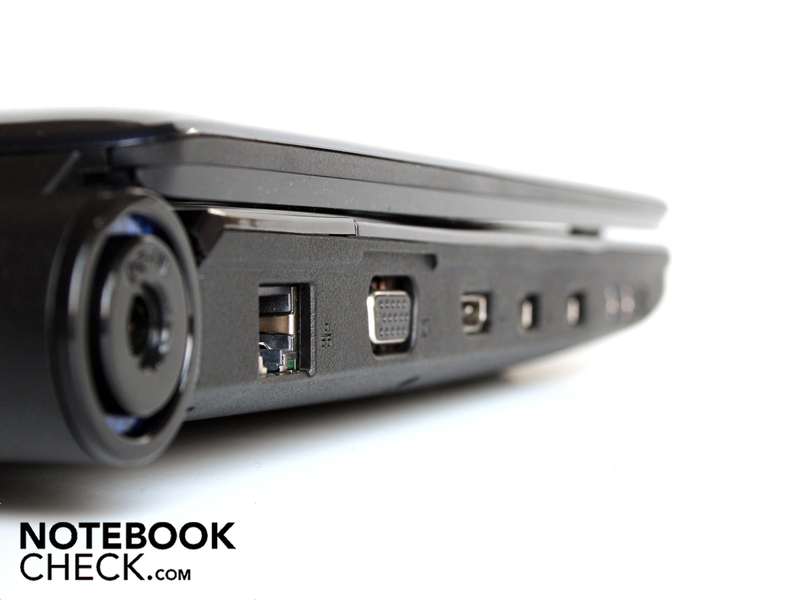 The connectivity is rather thin for the notebook category. There isn't an ExpressCard slot, an eSATA or Firewire. 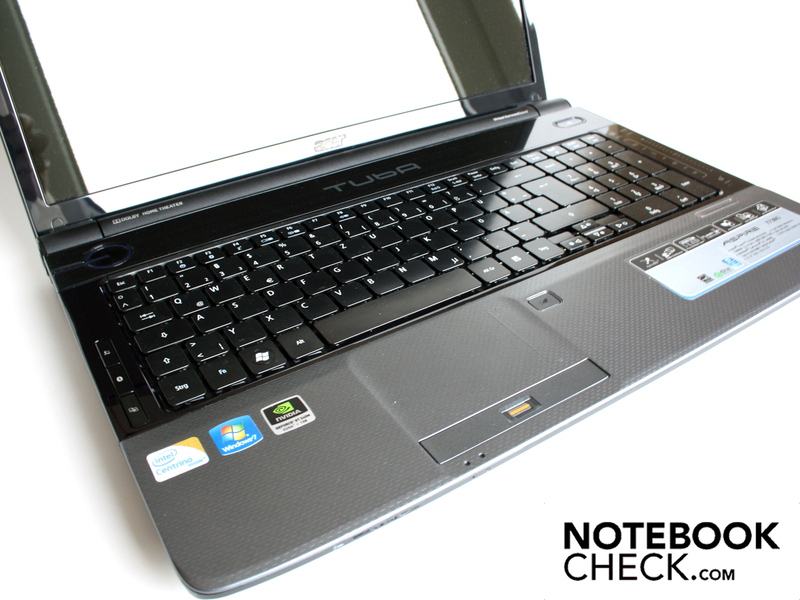 The Acer Aspire 7738G is a 17.3 inch laptop.. The bass roll (tuba) in the notebook's rear dominates the optic. Even the warm waste heat has to find its way over the bass roll. The only connection on the front is a cardreader. However, the handling isn't good because we can't see the slot. The big 120 watt adapter weighs 730 grams. The 17 incher's base plate has two maintenance covers. Of course, the battery has to be removed before replacing components. The 500 GB Hitachi hard disk is found underneath the big cover. The cover is fitted with a sheet of metal that distributes the waste heat. The user can retrofit a second hard disk. The spacers have to be removed beforehand. These provide for stability in the cavity. The four GB RAM is on two bars á 2 GB. 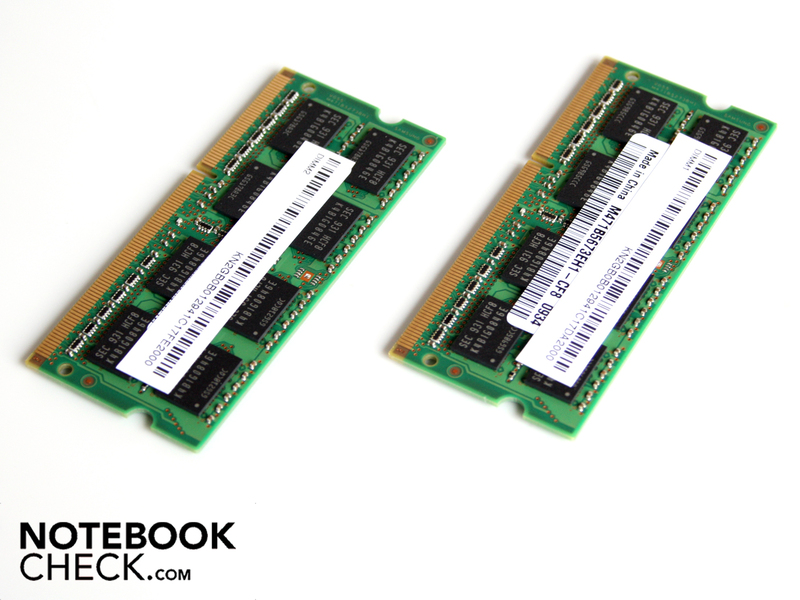 We find a DDR3 with 4096 MB. The graphic card is on a MXM module. At least this separate board beside the processor indicates it. 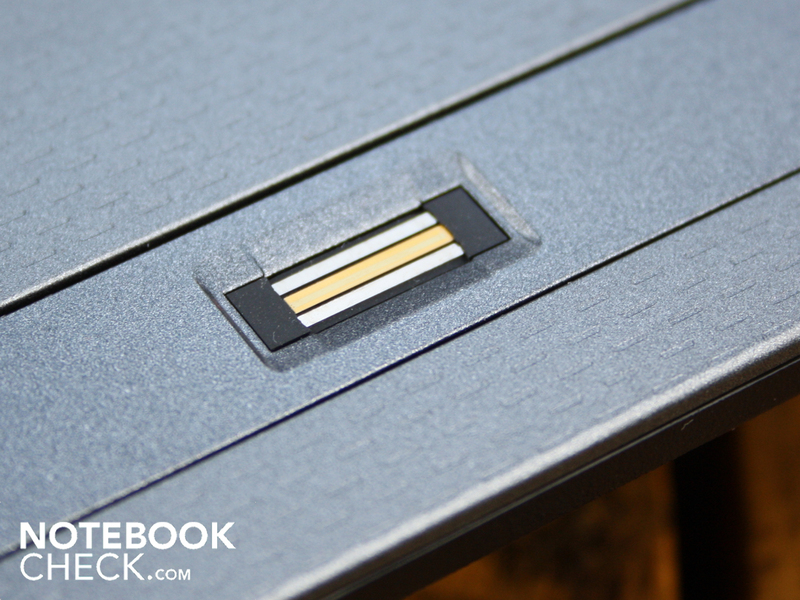 There's also a Kensington lock for attaching the laptop to the table. Both of these USB ports are very close to each other. Broad USB sticks can evade to the other ports, though. It's not suitable for transport with its massive size. The case is stiff and sturdy, except for the lid. The 7738G is rather more a desktop replacement, the reflective display doesn't like the sun much. In return, home cinema fans won't be disappointed. The tuba bass roll provides a balanced sound. 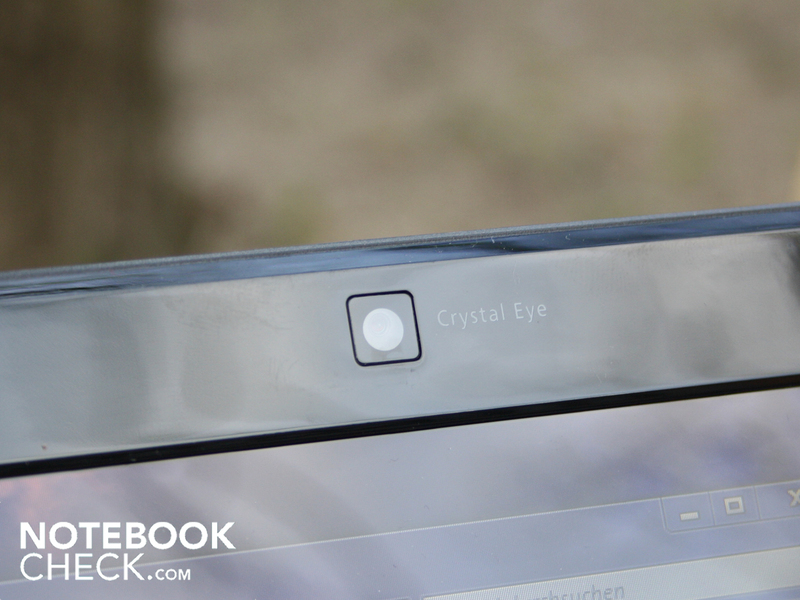 Optical details like this power button give the 17 incher a high-end appearance. 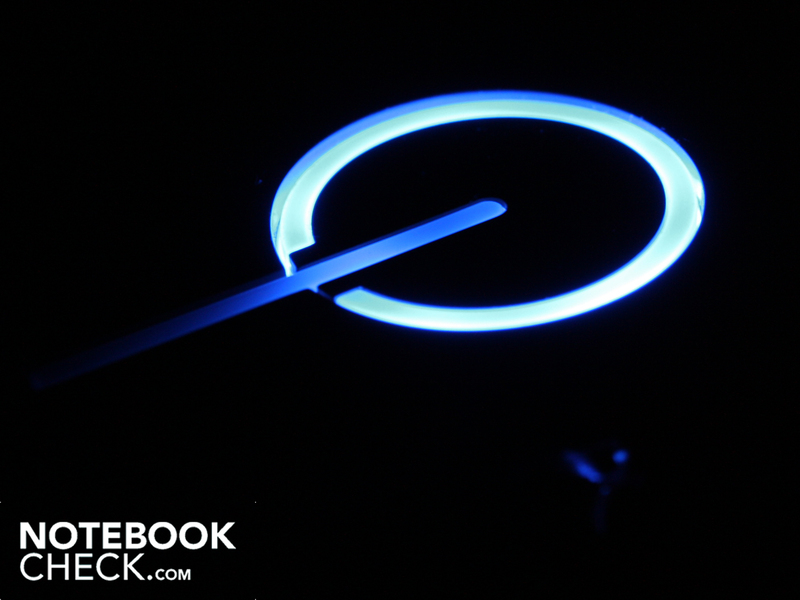 The power button lights up in use, which is very evident in the dark. 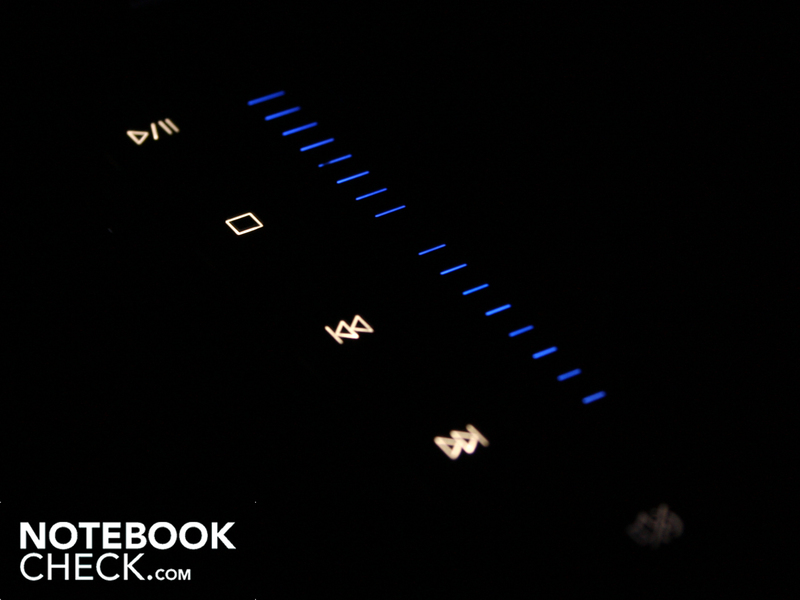 The MediaControl bar has a start, stop, mute and volume control. This panel lights up so the control works at DVD watching, too. These hot keys enable the wireless modules and call up a backup tool. 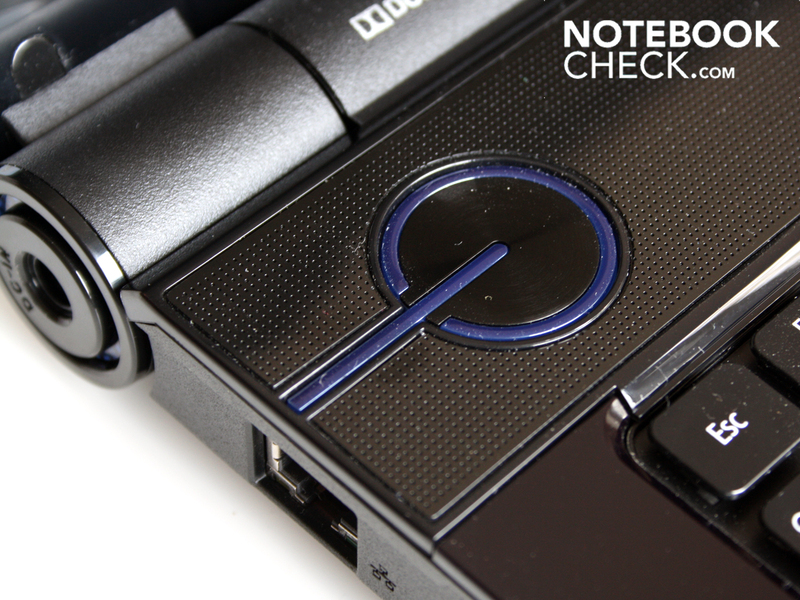 The notebook's access can be personalized with the fingerprint reader. The webcam shouldn't be left out. More than 1.3 megapixels isn't possible, though. The Power Smart key enables an energy savings mode. The 7738G definitely needs the energy savings mode. The four core processor, Q9000, lets a high power consumption be assumed. A 17 incher that doesn't have to ornate itself with a high-gloss finish on the wrist rest. Where's the TV card and remote control? If there is no gaming hardware, then there should be the full load of passive entertainment. The four core CPU, Q9000, doesn't help gamers at all due to its low 2.0 GHz clock rate. 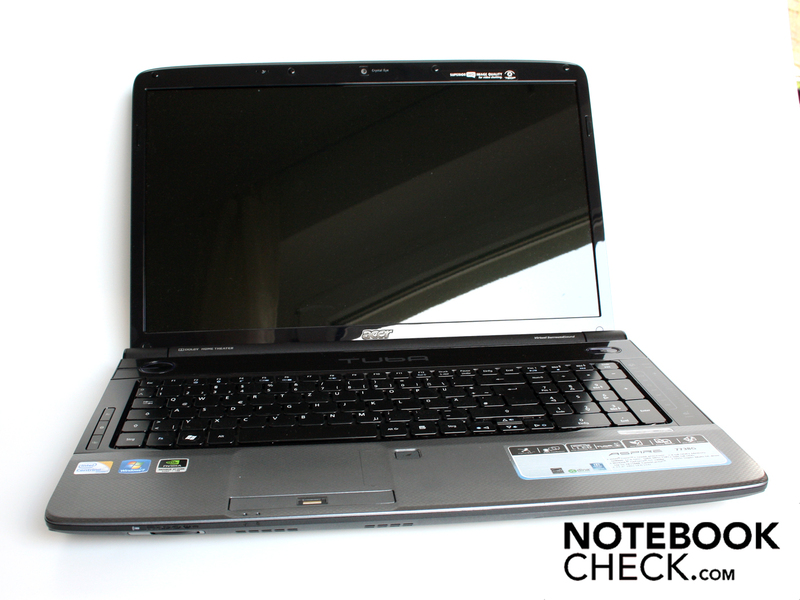 Notebooks with a high clocking Core 2 Duo that supply more fps are already available for considerably less money. If you want a quad, you should take a look at the new Core i7 laptops and then look for a suitable 17 incher. MSI's GT640; mySN's XMG7.c; Asus' G60J; Deviltech's Devil 9700 DTX (W860CU); Acer's Aspire 8940G; Dell's Studio 1557; MSI GT740.